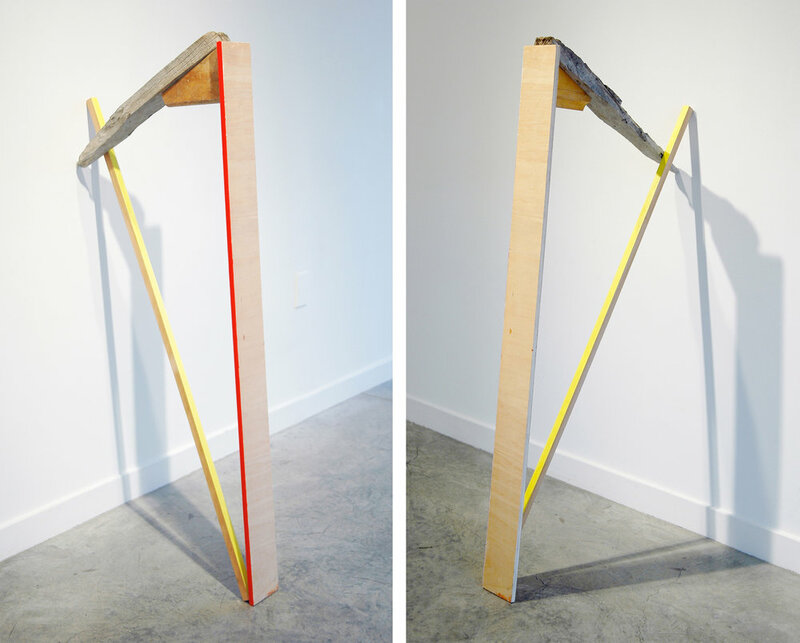 Untitled (rainbow), wood, acrylic, plexiglass and resin, 29" x 24" x 42"
Untitled (harp), wood, acrylic and resin, 48" x 23" x 5"
Untitled (fountain), wood, acrylic, metal and resin, 97" x 40" x 41"
Untitled (ledge), wood, acrylic and resin, 52" x 19.5" x 16.5"
Romer Young Gallery is pleased to present its third solo exhibition with artist Kirk Stoller, Thrown a Curve. Thrown a Curve expands on Stoller’s ongoing discourse between object and metaphorical emotional states. 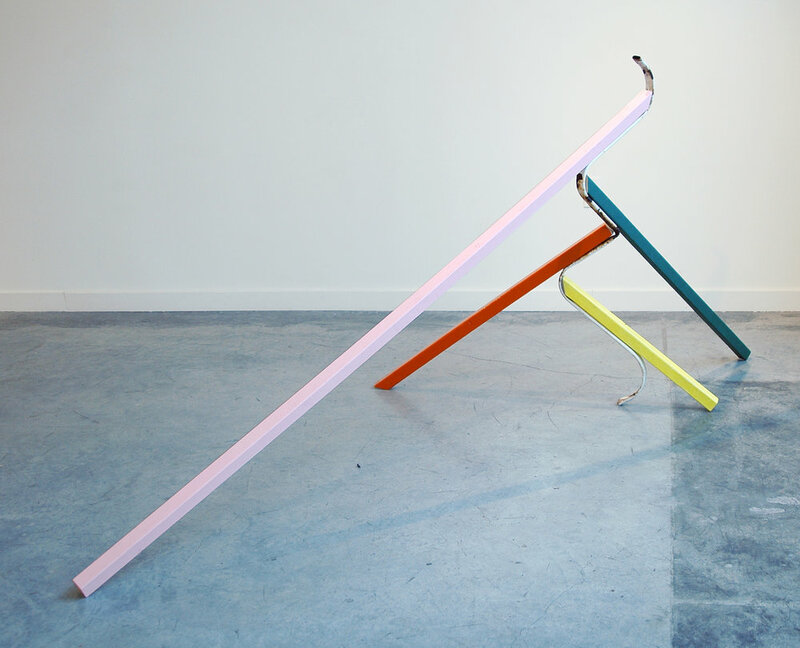 At first glance, his sculptural objects exhibit an overt instability. The collection of small, precariously placed pieces that rely on each other for strength and support, accentuates a relationship to the fragility of life. Yet despite first appearances, each sculpture is subtly engineered to defy expectation and reveals an underlying stability, an inner strength, and an enduring core. 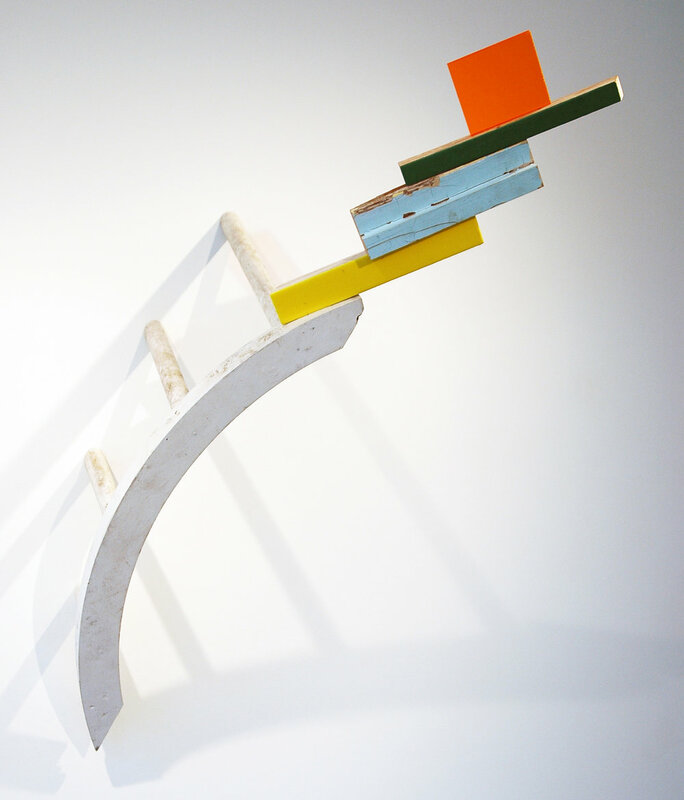 Stoller’s sculptures are built of found wood, plastic, metal, and parts of things that have been divorced from their original context. These weathered materials are then combined with gloss-coated surfaces and custom colors that are part of the artist's personal lexicon. Stoller accentuates these formal concerns while also contemplating the history and evidence of past actions contained in many of the parts. Through these juxtapositions unexpected narratives arise. Kirk Stoller was born in Oregon and was raised on a small farm outside of Portland. He received his BA in French Language from Portland State and his MFA from UC Berkeley. Stoller's work has also been exhibited at the Mary Ryan Gallery, New York, Storefront Bushwick Gallery, Brooklyn as well as Galerie Axel Obiger in Berlin. In 2012 Stoller was an Edward Albee Foundation Fellow. He was also awarded the Marie Walsh Sharpe Art Foundation Studio Residency in New York and a MacDowell Art Colony Residency. Stoller was a studio resident at the Headlands Center for the Arts from 2004 – 2007. The artist would like to thank Playa Art Residency for the opportunity of time and space needed to conceive and create the work for this exhibition.